Whether you’re getting married this year or next, it’s never too early (or late) to think about the finer details. Those little personal touches that make your big day feel truly personal and unique. We at Peck & Chisel are suckers for a country wedding, so below are just a few of our ideas ideas on how you can really incorporate the ‘english country’ vibe into your big day. Wedding seating plans are the most political part of planning a wedding. Who needs to avoid who, how to pair up the singletons, who will be offended if they don’t get a prime spot and where to put the kids! But that doesn’t mean that the final plan shouldn’t look beautiful, after all it was a slog getting it right, so it should look good. Give your seating chart a rustic edge by using a large oak framed chalkboard. You can even engrave the frame with your names or wedding date to give it hat extra personal touch. Just make sure you enlist the help of a bridesmaid with pretty penmanship to make the chart, and get her to doodle flowers or vines in any unused space. If your serious about having a countryfied wedding, serving your guests appetisers on silver trays as supplied by the catering company, just won’t do. Be playful with your appetisers and serve them on rustic oak and walnut boards. You can have fun by engraving the platters with tongue in cheek slogans or food based puns and adorn the platters with outdoor (but food safe) foliage to really amp up the country theme. Don’t underestimate how hungry your guests will get, especially after a couple of glasses of wine. Serving a selection of local British cheeses, breads and meats a couple of hours after the wedding breakfast, is a great way to keep your guests full. 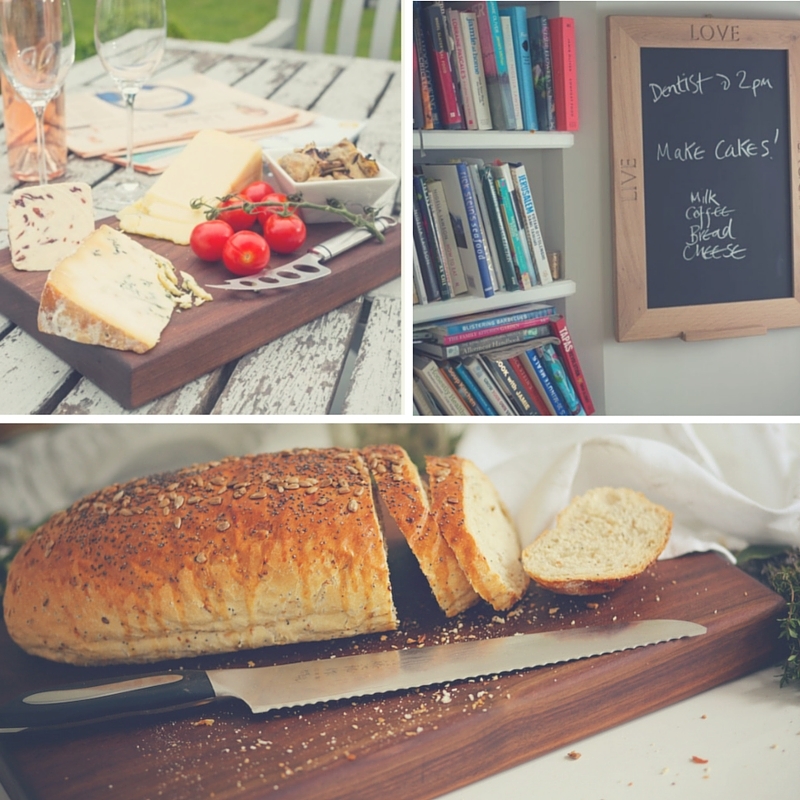 Our rustic wooden cheese boards, available in oak and walnut have a beautiful ‘unfinished’ look that will give your wedding decor an authentic outdoor country feel, even if the British weather keeps you indoors. All items mentioned in this post are made bespoke in our Devonshire workshop and are available in oak and walnut. If you are looking for something specific, that you cannot see on our website, get in touch and we can work together to create the perfect personalised pieces for your big day.